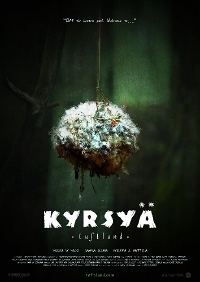 Stumbled across this wonderfully creepy trailer for an upcoming Finnish horror film called Kyrsyä - Tuftland. The film is about a young girl who travels to a small town to get away from her problems only to find herself is what appears to be a kind of Wickerman deal. The film is based on a play by Neea Viitamäki and was written and directed by Roope Olenius. Balancing between a failed relationship, uninspiring studies and financial problems, the headstrong textile student Irina finds herself stuck in the modern rat race. To overcome her problems she decides to accept an unexpected summer job offer at the secluded and self-sufficient village of Kyrsya. As Irina begins to get a grip of herself in the middle of the endless Finnish forest, the harmless and offbeat hillbillies begin to reveal their true nature. Kyrsya has been playing fests for the last year si I'm surprised I haven't heard of it until now. Here's hoping there'll be news of a release soon.